A play cannot exist without a stage manager, especially a play with lights, props, entrances, exits, movement, story, and flow. The person who received the Williston Working Artist Award on May 10 is someone who remains invisible during performances, but without her, Williston literally could not have put on a show, theater director Emily Ditkovski said as she presented the award. 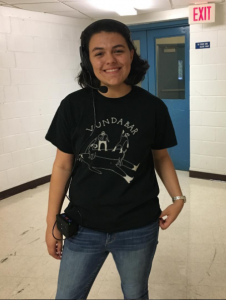 As stage manager of the spring production of Peter and the Starcatcher, Risa Tapanes ’18 was responsible for knowing every component of the production, including every actor’s blocking (movement on stage) and when each prop should come and go.